Apollo 8 is the world's most acclaimed professional recording interface for Mac and Windows, giving project and commercial studios superior A/D and D/A conversion with the tone, feel, and realtime workflow of classic analog recording. Built upon UA's 60-year heritage of audio craftsmanship, Apollo 8 distinguishes itself with four Unison-enabled mic preamps, the option of UAD-2 QUAD Core or DUO Core processing, and an included bundle of award-winning UAD plug-ins -- which you can track through with near-zero latency, shaping sounds like a classic analog studio -- without taxing your host Mac or PC. Apollo 8 vs. Apollo Twin? Apollo 8 features four Unison-enabled mic preamps, letting you track through exacting mic preamp emulations from Neve, API, Manley, and Universal Audio. An Apollo exclusive, Unison technology nails the tone of these sought-after tube and solid state mic pres -- including their input impedance, gain stage "sweet spots," and the component-level circuit behaviors of the original hardware. The secret to Unison is its hardware-software integration between Apollo's mic preamps and its onboard UAD-2 QUAD Core or DUO Core DSP Acceleration. Simply place a Unison preamp plug-in on your mic input, and tap into the classic sounds of the world's most recorded mic preamps. Right out of the box, Apollo 8 provides a suite of incredible analog emulation plug-ins including the world's only authentic Teletronix LA-2A, 1176LN, and Fairchild compressors, the legendary Pultec EQs, and the Unison-enabled UA 610-B Tube Preamp. Developed by UA's world-renowned team of algorithm engineers, these Realtime Analog Classics plug-ins set the standard by which all other hardware emulation plug-ins are judged. 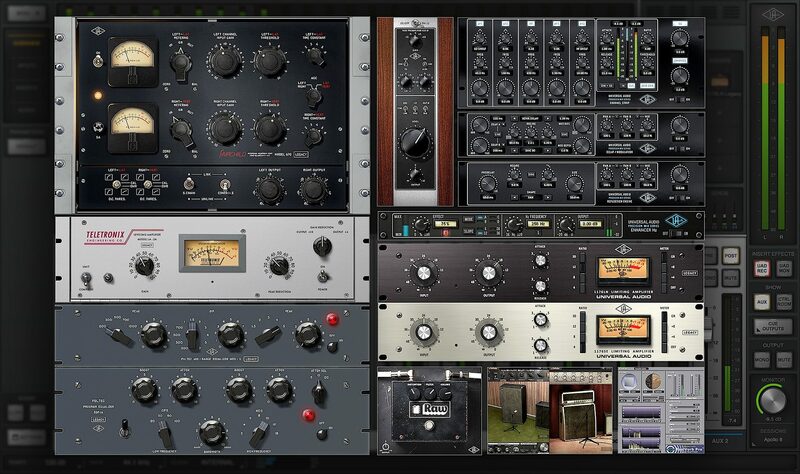 Beyond the included Realtime Analog Classics plug-ins, you can tap into the full library award-winning UAD Powered Plug-Ins -- including vintage EQs, Compressors, Reverbs, Tape Machines and more -- at near-zero latency, regardless of your audio software's buffer size and without taxing your computer's CPU. With exclusive emulations from Neve, Studer, Manley, API, Ampex, Lexicon, Fender, and more, it's like having an endless analog studio, in a single rack space. And unlike competing interfaces, these DSP-powered plug-ins are also available in your DAW for mixing. Of course, the heart of any audio interface is the quality of its conversion. In designing the next-generation Apollo range, UA engineers started with an obsessive auditioning of the latest A/D and D/A converters, ultimately pairing the selected 24-bit/192kHz converters with all-new analog circuitry for the optimal signal path. Apollo 8 provides increased dynamic range and lower THD versus other interfaces -- rivaling dedicated converters costing thousands more. Apollo 8 offers 18 x 24 simultaneous inputs/outputs, with two built-in Thunderbolt ports. 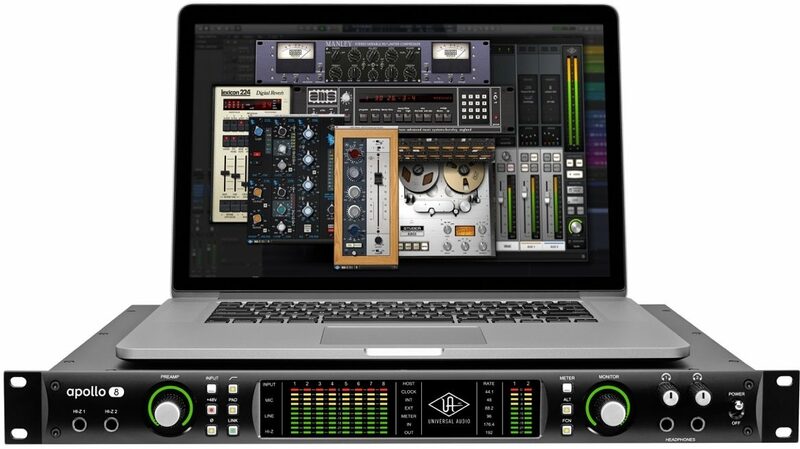 Thanks to Apollo Expanded software, users of any Thunderbolt-equipped Apollo Twin, Apollo 8, Apollo 8p, and Apollo 16 audio interfaces can combine up to four Apollos and six total UAD-2 devices -- adding I/O and DSP as your studio grows. Apollo 8 also provides seamless integration with previous generation Apollos over Thunderbolt. Apollo 8 includes the "Realtime Analog Classics Plus" UAD plug-in bundle. Other UAD plug-ins sold separately at www.uaudio.com. All trademarks are property of their respective owners. Overall: The Apollo 8 is awesome. The four preamps are super clean and clear sounding. It's also easy to color instruments on the way in, via UAD plugins in console, or to track with parallel compression. The other four inputs are ready for my own preamps. Controls are easy to use. Two headphone controls on the front are perfect for my needs. UAD plugins are a bit expensive; however, you get several awesome free one's when you buy the Apollo, plus the benefit of great sounding plugins not taking any of your CPU. They also have good customer service. Style of Music: Alternative Rock, electronic, folk, minimalism, instrumental. Overall: I've always enjoyed UA products (I own a 6176) and a few of my friends own UA products. So when it was time to upgrade my studio, everyone suggested the UA Apollo 8 Tunderbolt. This was the best decision/investment I've made! It's so classic, and the mic preamps are wonderful, giving you that warm analog sound! I plan to purchase another one (perhaps the Apollo Twin or 8p) by the end of the year!